Grain de musc: London launch of Séville à l'aube at L'Artisan Parfumeur: Mission accomplished! Actually, I think the Luisieri lavender story is a little more strange than you know. I'd visited BD in his lab the first week of July, 2010, and wanted to bring him a funny present. I knew he had "mixed feelings" about lavender, haha! So I brought a lavender that was very obscure, from Spain, that was beginning to be used in aromatherapy circles. He said he'd never tried it before, and wanted to know where to get some, because it was rich, complex and totally "un-lavender like"- the small bottle was from Eden Botanicals, but he said he was going to hunt it down in France and find a supplier. And so he did! That it's known as "Seville Lavender" is wonderfully serendipitous, it's like it was waiting for its moment, and the timing was perfect. Marla, in fact, I did know the story. It was indeed a serendipitous find -- the fact that it was introduced by a larger supplier clinched it. 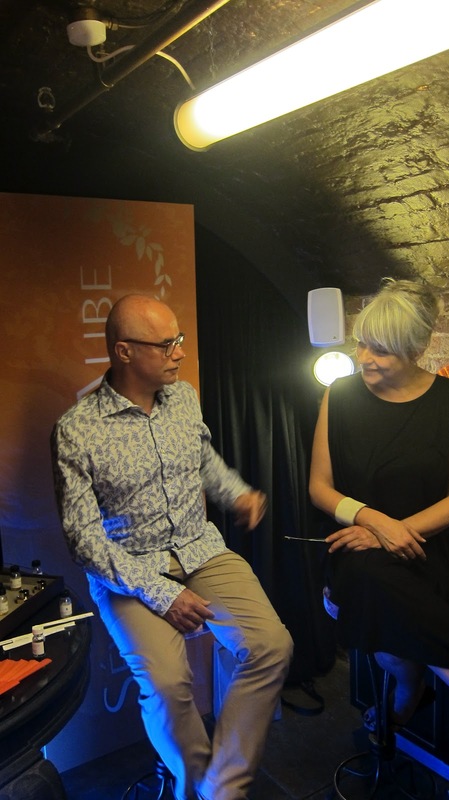 Great launch, wish I was there! 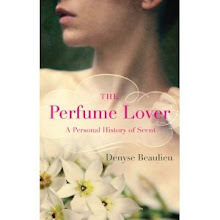 Any more chapters of that fragrant story planned in the future (in terms of next scents, of course)? Pete, that is very sweet of you to say. Just as I was writing a friend that some pictures made me want to don a burka! As for new chapters, Bertrand and I are indeed working on a new project, but it won't be linked to a book (there are things you can only do once). Can't say more for the moment! Ohh, I can not wait then! Pete, it'll be a while yet (for the scent of course, not the burka), thanks for the vote of confidence! It's incredibly exciting to hear about this project. The book is en route, and I hope to somehow get the fragrance before its launch next year. Congradulations to you, and thank you so much for the joy you have given us over the years. Carole, the fragrance will be available worldwide in September so you certainly won't have to wait too long to discover it. And thank *you* for such kind words. Ariane, I'll certainly be in New York for my book launch if I have to swim there! Since the perfume will be out by then, I very much doubt Bertrand will be there though. One of the samples I shipped has already made to Australia so I imagine yours should reach you soon. congrats to you, and to the fragrance for "using" you to manifest! can't wait to try it! off-topic, but wanted to tell you that i LOVE your hair! i'm letting mine go silver, and i love seeing it on other women. you look fantastic! hope more women see how wonderful it looks and take inspiration from it! Denyse, thanks for this post. I was just thinking about this today and hoping for a bit more of Bertrand's side of the story, so this is perfect. Amazing indeed about the Seville lavender - this perfume was meant to be! I love it that you're still learning about Seville a l'aube and its mysterious artistic genesis. I can't wait until it arrives in the states so I can have my own bottle. 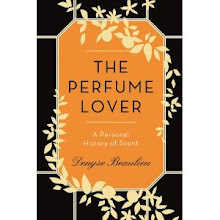 I'm a solid fan of the fragrance--and your book. Where the heck are you in the photos? It looks like an underground bunker. Minette, the silver/grey hair thing has been trending in Paris these past few years. 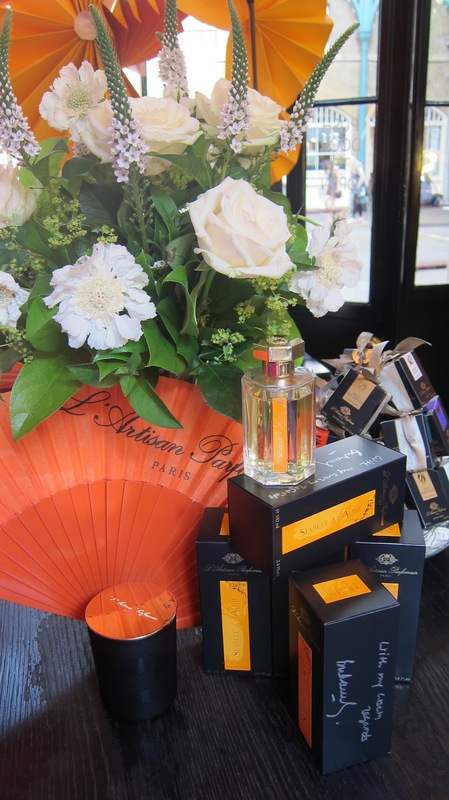 My moment of glory came when Serge Lutens himself complimented me on it. March of the Perfume Posse wrote a long post on this a while back and it seems you and I are not alone! I had it up on the pictures, but it goes beyond my collarbone: I decided to add insult to injury and grow it long. The key is lots of shine, and some colour on the lips. Justsoyouknow, on the odd chance you're a real person: comments with commercial links are not allowed, so I suppressed yours. Sorry. Nozknoz, lots of people interviewed us, including Lila Das Gupta of Basenotes and Katie Puckrik who filmed us for Katie Puckrik smells, so you'll be getting more direct quotes from Bertrand (which for obviously reasons I couldn't note). It's great that Luckyscent is already taking pre-orders (I've heard from Franco there are tons coming in). Angela, isn't it? Still learning, and still falling in love with it over and over... 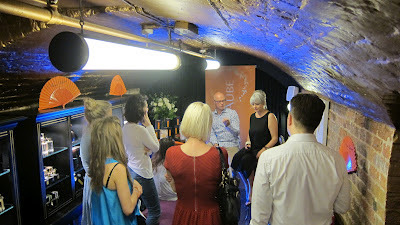 The venue was the L'Artisan Parfumeur boutique in Covent Garden Market, which has a cellar -- it did seem like we were taking cover from the Blitz! The downside was that it was tiny: it couldn't handle large groups, so we had to greet sucessive "waves" of clients and do our little show several times over. The plus was this afforded more intimacy with the public. Also: it was nice and cool, whereas the heat upstairs was fierce! Ankica, I don't know where you live, but as I said above, Séville à l'aube will be available worldwide in September. Many people who've read the book said they'd expected a darker fragrance, so be warned: there's a huge, exhilarating burst of sunshine in the top notes! 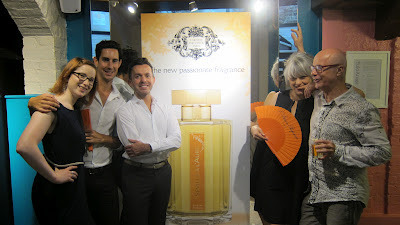 I briefly smelled the Seville in France but not thorough enough to comment , I did like it tough! I read over at Katie P. that she filmed the whole event; any chance of seeing it soon? Could you get her to hurry? Also read she compared the 2 of you to a grumbling old couple. I have a hard time imagining that. Do keep us posted about ANOTHER?? scent. PS : Still feel bad about the ridiculous sample I sent, will make up for that soon! denyse - i remember the 'silver' post on the posse - i chimed in! i agree - shine and some color in the face are critical (emmylou harris does it beautifully). my hair has been short and spiky (a modern cut is also critical, if you keep it short), but i recently saw a woman with a long, tangled silver ponytail who looked incredible, and i thought - i want that! so i am growing mine back out! maybe by the time it's long again it will have more silver in it! as it is, i get lots of compliments on my hair color - everyone thinks i have highlights. It must have been such an interesting gathering - I would have had many questions to ask! I'm chiming in, however, because I finally got the chance to smell the fragrance. And I am so moved that I had to write it somewhere! It is really a wonderful rendition of Orange Blossom - and is much more than that, actually. It smells diffrent from what I expected from your book. But that is not a criticism. Minette, I started short and spiky, and now my hair is longer than at anytime since I was thirteen (which was, even by my mother's admission, my most felicitous period). Why the hell not, right? Zazie, so happy you love it! You might get a chance yet to ask those questions if you attend Pitti Fragranze. Congratulations, Denyse. Séville à l'aube is breathtakingly beautiful, and I'm glad the launch was a success. I'll move heaven and earth to be there. I haven't tried Seville a l'Aube yet (no retailer anywhere near damnit) so I can't offer any true comment about it but I trust your taste completely, to the point I am considering an unsniffed purchase from l'Artisan's site. 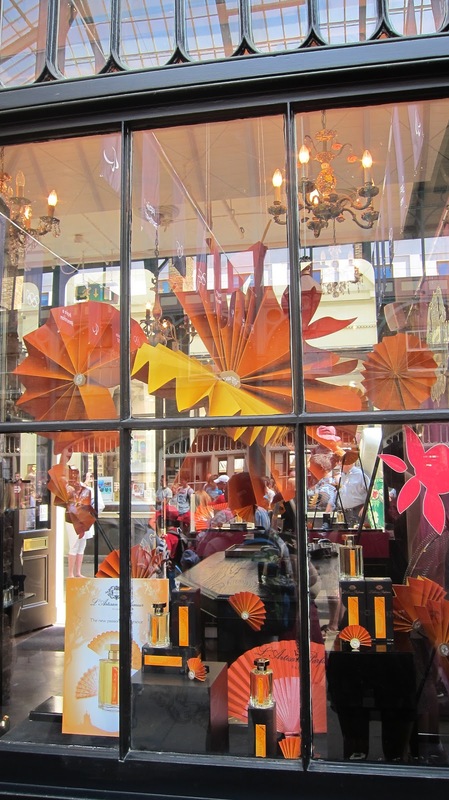 The arangement in the shop window is amazing btw! As for retailers, anyway I think you'd have to wait until September outside France and London... But thanks for the vote of confidence!